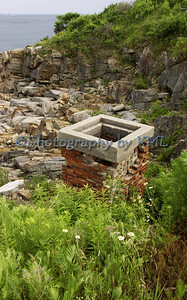 Not sure what the story is behind this chimney, but it is all that remains of a house that once stood here. We were walking along the walkway by the Portland Head Light, and there it was off to the left. Quite over grown by all the weeds, and we were above it. There must have been quite the house there at one time, built into the side of the cliff. You can just barely see the ocean at the top of the photo. What a view this house had! 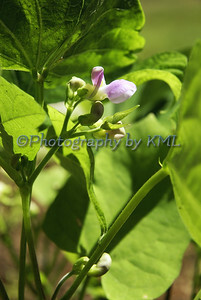 A couple of weeks ago, the green bean plants in the garden were filled with these pretty little blossoms. Green beans are such quick growers, we have had two great meals of them already. We staggered the planting over a couple of weeks to try to stretch the growing season of them out a bit longer. We will get another meal, but I fear they have pretty much produced all they are going to for this year. The few that will be left will be for the hungry gardener who loves to eat them raw - just picked from the plant - Me! A big rusty old anchor. 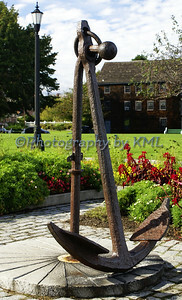 The anchor is a historical piece and it is located in a park beside the ocean near the historic Strawbery Banke. It is considered a memorial in remembrance of all the souls that have been lost at sea. I grew up right beside this park many years ago, and this anchor has always been there. It is surrounded by beautiful gardens, and once a year there is a ceremony to honor these people. 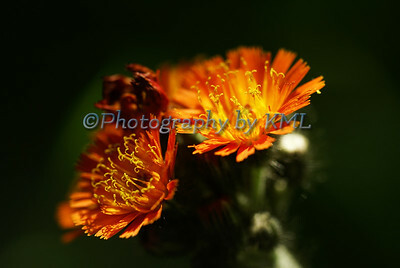 Since we were kids, we always referred to these bright little wildflowers as Indian Paintbrush. When looking it up online, I found that that particular wildflower grows along the western side of our country, and I am located on the east. So, I am not really sure of the correct name for these little beauties. Perhaps they are an eastern version, or perhaps not. Either way, we will continue to enjoy them, and will call them by their real name once we discover what it may be. Last week's post for ABC Wednesday had me going to my favorite place - the ocean. This week's post described how I felt after about 3 hours in the hot sun - totally zapped with no energy. We had lunch on New Castle Island, and it was still very hot - over 90 degrees in the shade. Then I took a walk around the old fort on the island. 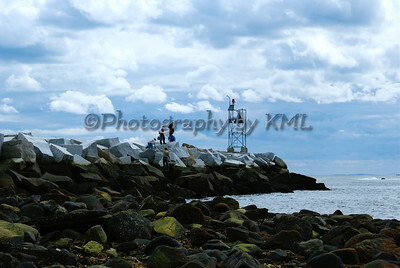 As soon as I stepped off the land onto the rocks behind the New Castle Lighthouse, it was like a whole new world. The cool breeze coming off the open ocean into the harbor was so refreshing. I sat there by myself for about an hour. I called and texted the boys to join me because it was sooo cool, but they just couldn't leave their fishing poles. My husband finally came over and wished he had come earlier. 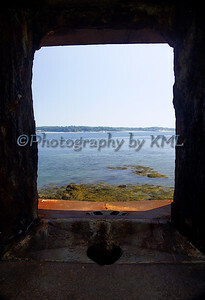 The photo above was taken through one of the windows of the old fort. It was just on the other side of that window where the coolest breezes could be found! 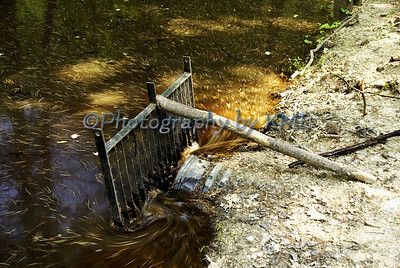 Rather than an outdoor image, I thought I would share a different kind of photo for My World this week. My birthday was a couple of weeks ago, and I have finally gotten around to processing the images in my camera. As a gift, my Aunt treated me to a pedicure - a first for me. I was quite leery about this whole adventure - my toes are just not the kind that liked to be touched. Way too ticklish and sensitive. She bought me the "deluxe" version that included a massage and wraps for the legs. Man, I felt like a queen with the hot water jetting around my feet, the chair giving my back a massage, and my legs chilling with warmth - tough to describe that feeling. The lady's hands worked wonders on these old feet, then she topped it all of with polishing the toes. And designing pretty little flowers on the big toes with a tiny paintbrush. She even set a red stone in the center of each flower. I felt spoiled for sure! And you know, it has been a couple of weeks, we go swimming every night, and those toes still look just a fancy as when they were first done. It was a perfect treat for the summer! ABC Wednesday - Y is for Yeah! We are going to be spending the day at the ocean - my most favorite place to be! It has been way over a year since we were last there, and the sea has been calling to me in a loud voice. Having been raised by the ocean, I miss being there, smelling it, feeling it, and hearing all the beautiful sounds it makes. It's going to be oh so hot - temps are predicted to be in the high 90's to 100 degrees. Sunscreen, lunch, camera for me, and fishing poles for the boys. The crazy beaver that lives down the road is at it again. Pretty soon he will have the water over the road - again. We keep an eye on his activities and try to adjust the grate across the culvert to keep the water flowing to prevent the mischief he likes to cause. But I think he hears that water flowing too rapidly. And it is not to his liking. He comes and stops up the grate with more mud and sticks. It won't be long until he has that grate packed solidly - then there will be no moving it. The town will have come down with the backhoe and dig it all out. And sooner or later they will hire someone to trap him. If he would only he would stop trying to "fix" it. He has created a beautiful dam further behind this culvert, but I guess like all living things, he can't stop wanting more. We will continue to help him as long as we can. Our country is another year older and it's time to celebrate. 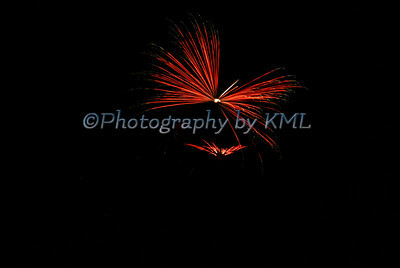 This is a shot from last year's fireworks display. One of these days I will capture them just right, but this one came out pretty good nonetheless. It reminds me of a dragonfly. Hope all my US readers are enjoying this holiday.